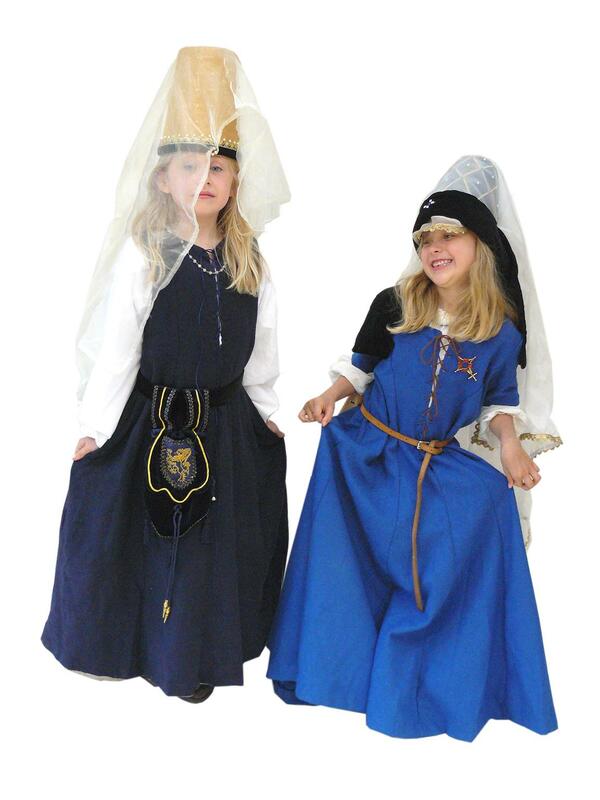 We offer your visitors, young & old, male & female, the chance to try on medieval clothes of every status from the well to do down to the humble peasant. This display is run for passing trade throughout the day and always has a queue! Perfect for little lords & ladies. Clothes in the medieval period were quite different to the clothes we wear today. There were no jeans, t-shirts or trainers. No Gucci, Adidas or branded clothing. Cotton was not used to make clothing and there were no man made fabrics like polyester. Clothes were largely made from wool, silk, velvet, linen or perhaps the fabulous cloth of gold. All clothes took a great deal of time to make as everything was hand made and many people might only own one or two sets of clothes. In the 15thC a poor persons clothes would be made of wool and linen. A linen undergarment was worn first, either a shirt for men or a shift for ladies (which resembles a night gown). On top of this a woman wore a dress called a kirtle, men wore tight trousers called hose and a jacket called a doublet which would hold up the hose. Both sexes wore a belt and pouch (to keep all their bits and pieces in as there were no pockets). Hats were worn often in medieval times, especially by women. Hats kept you warm in Winter and kept the sun off your head in the Summer. There is also some indication in the bible that women especially covered their heads for religious reasons. Most lower class ladies hats would simply be made from linen. The clothes of the rich lords, ladies and merchants were essentially the same as those for the lower classes but would have been made of much finer fabrics. Silk and velvet were both expensive fabrics in medieval times. They may even have been made from cloth of gold (a fabric woven with real gold thread). But many sumptuary laws were bought in by various Kings to stop the wealthy being too ostentatious. Fur would have been used to trim their garments. Fine jewels and gold embroidery would have bedecked their clothes and hats. Clothes were often cut to waste material so a rich person could show off how wealthy they were. They would have been a marvellous spectacle to behold. Many express surprise at how comfortable they find the clothing and ladies of every age love trying on the dresses and hats.